This August, HBL and Daraz are celebrating a story that entails the blood, sweat, tears and dreams of millions of Pakistanis. Seventy years on, against all odds, Pakistan is forging on the path of growth and development as the nation continues to endure the stories of millions of Pakistanis surmounting extraordinary obstacles to achieve their dreams. Daraz and HBL could not be a more complementary partnership. As an institution, HBL has played an instrumental role in the nation’s economic progress since the country’s independence. Today, HBL is the largest bank of Pakistan, at the core of HBL is its philosophy of enriching lives and enabling dreams of its customers and the society at large. Daraz, on the other hand, is the digital powerhouse of the country, proud to have given e-commerce culture a home to call its own in Pakistan. In a short span of time, Daraz has cast a wide net over Pakistani commerce, its services penetrating the most bustling of metropolises and the humblest of villages. The HBL Independence ShopFest will bring discounts up to 70%, to celebrate 70 years of independence. 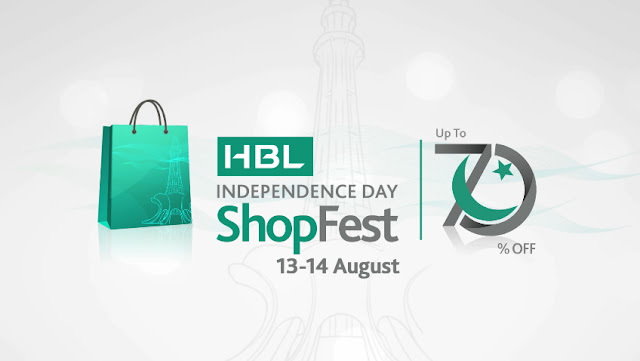 Additional discounts will be available to all HBL credit and debit cardholders.